Electro Breeze Supply offers the best pricing for your Electro Breeze commercial air cleaner replacement pads and the testing data to show they can also replace the Dynamic commercial air cleaner replacement pads. Maintenance and service providers for casinos, high-rise office buildings, schools, hospitals and churches know that Electro Breeze Supply provides the very best in quality and customer service. Just call 800-916-7873 to place your order. Custom sizes and mixing/matching are no problem and, as always, free shipping in the continental US and Canada! 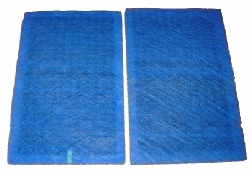 The Electro Breeze commercial air cleaner replacement filter pads are available with the Carbon core or the Mesh core. Let your customer representative know your preference. Both types offer the same air cleaning performance with the Mesh core having a lower pressure drop. Call 800-916-7873 to get your quote for large projects. All quotes include free shipping in the continental US and Canada! Comparing the Electro Breeze commercial air cleaner replacement filter pad side-by-side with the Dynamic commercial air cleaner replacement filter pad shows that the two are nearly identical. The Electro Breeze commercial air cleaner replacement filter pad is held together with plastic staples, which is more rigid, while the Dynamic commercial air cleaner replacement filter pad is glued together and known to off-gas. You will also notice a small insert at the bottom of the picture. This is a tube for the electrode of the Electro Breeze commercial air cleaner to insert into the commercial air cleaner replacement filter pad. If you are using the Dynamic brand of commercial air cleaner, you will simply lay the pad into the commercial air cleaner and disregard the tube. It is of no consequence, nor does it interfere with the operation of the Dynamic commercial air cleaner. Call 800-916-7873 today! The Electro Breeze commercial air cleaners come in several configurations, including this flat panel that is perfect for side sliding applications. Many of the smaller rooftop air handlers are utilizing a side access door to the filter section with a sliding rack for the filters. The Electro Breeze and Dynamic commercial air cleaners, as you can see in this picture, are actually two 1 inch filters side-by-side to make the 2 inch commercial air cleaner. The Electro Breeze and Dynamic 2 inch panel will take the Electro Breeze commercial air cleaner replacement filter pads in place of the Dynamic commercial air cleaner replacement filter pads. Another configuration for the Electro Breeze commercial air cleaners is the popular V-Bank. 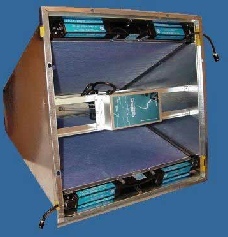 This picture shows the Electro Breeze commercial air cleaner V-Bank with an integrated ultra-violet unit. This is a face mounted V-Bank and can be made in an infinite range of sizes up to 36 inches wide. The Electro-Breeze commercial air cleaner V-Bank is an acceptable alternate for the Dynamic commercial air cleaner V-Bank. 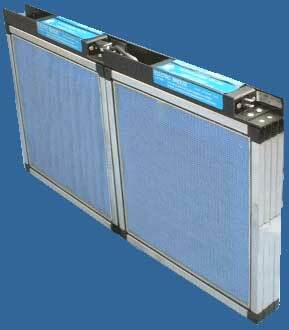 With the front access for filter change, it provides fast and easy maintenance. The Electro Breeze and Dynamic commercial air cleaner V-Bank will take the Electro Breeze commercial air cleaner replacement filter pads in place of the Dynamic commercial air cleaner replacement filter pads. Call 800-916-7873 today! 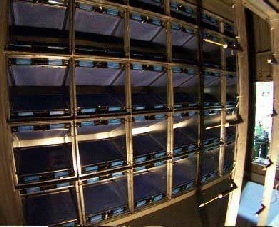 Here you see a large bank of the Electro Breeze commercial air cleaner V-Banks. As you can see, there is plenty of access room for the replacement of the commercial air cleaner replacement filter pads. One control box is attached to the outside of the air handling unit where the technician can check at a glance that the Electro Breeze commercial air cleaners are operating properly. Ask your customer representative about retrofitting your next project or current project with the Electro Breeze commercial air cleaner products. Call 800-916-7873 today!